Our springtime workshop dates are now available! 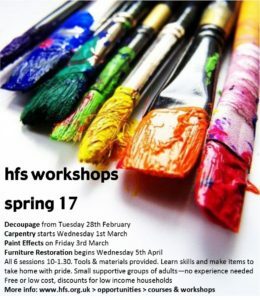 Join a small, supportive group to enjoy decoupage, furniture restoration, carpentry or paint effects at one of our workshops in Hastings or Bexhill. Free or low cost – discounts for low income households. All materials and tools provided. Make something special to take home with pride. See the calendar and joining info here.